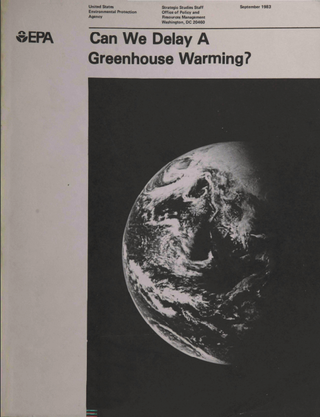 In 1983, the Environmental Protection Agency published a report titled “Can We Delay A Greenhouse Warming?” It ran through the latest predictions on climate change, and analysed the feasibility of several policy options, from taxes to fossil fuel bans, that could slow the coming catastrophe. It is one of the earliest EPA reports dedicated to the issue, and one of several pieces of evidence that experts were very much on top of the problem nearly 40 years ago. The report predicts a warming of 2 degrees Celsius by the middle of this century, which isn’t so far off from what scientists are predicting today. In spite of the report’s prescience, looking back on it now is an exercise in frustration. “The shift away from fossil fuels perhaps could be instituted more gradually and therefore less expensively if energy policies were adopted now rather than several decades later,” the authors wrote. This was blasted by Reagan administration officials as being “unnecessarily alarmist”—a reprimand we continue to hear decades later. The report’s warnings, obviously borne out by the subsequent 36 years of inaction, will leave many readers banging their heads against the wall. And if it frustrates the rest of us, what must it be like for the actual author of that report? Photo: EPAStephen Seidel was the 1983 report’s primary author, along with consultant Dale Keyes. With a background in economics, urban studies, and law, he was working in EPA’s Office of Policy analysis; now retired, he spent decades at EPA and elsewhere working on everything from ozone pollution controls to Obama Administration efforts at greenhouse gas emissions reductions. After a Twitter thread on his report seemed to strike a collective nerve, we spoke about his work at EPA, if he thinks we might finally be turning a corner on climate, and what it is like to have had his warnings ignored for almost four decades. This conversation has been edited lightly for clarity and length. Gizmodo: Tell me a bit about how you ended up working on global warming at EPA in the early ‘80s. And then John decided, with the change in administration, that he would move on to some other issues, and he actually was the one who began looking at global warming. He invited me to join him in this project, and that was sometime in ‘82, early ‘83. Gizmodo: The EPA was only a decade or so old at that point. What was it like to work there in those relatively early years? Seidel: There were a lot of very committed people back then, and I think that’s probably true today also. There was a mix of old-line engineers who had come over from the federal [agencies] that were pieced together to create EPA. But then a lot of very bright young folks [joined], all of whom had just attended their first Earth Day celebration, and were very committed. Gizmodo: Was climate change a significant part of the EPA’s work back then? Seidel: No one, to the best of my recollection, was looking at climate change at that point at EPA. It wasn’t on anybody’s radar screen at the agency. 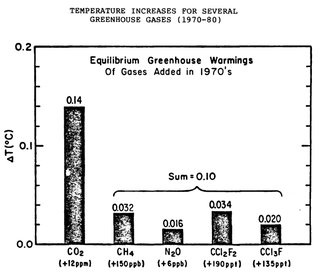 I believe this was the first report EPA put out on climate change. I’m positive it’s the first policy report, maybe somewhere in the bowels in the office of R&D somebody was looking at it, but I certainly don’t remember seeing such a report. Gizmodo: Did you receive any political pushback at the time, as you were working on it? Interestingly enough, our assistant administrator at the time was very supportive. He read the report, thought it made good sense, thought it was an important issue, and was very very supportive of the effort. It was a guy named Joe Cannon. In fact, he was the one who first provided a copy of it to Philip Shabecoff of the New York Times. They ran it as a front page story. That article on the front page resulted in a press conference EPA held that day, and probably a couple of weeks of constant press attention, worldwide. That was the classic 15 minutes of fame. Gizmodo: In that article, your report was contrasted with one from the National Academy of Sciences. The Reagan Administration seemed to hate yours and love theirs, maybe because you included more urgent warnings about the need to act sooner rather than later. Seidel: If you look at the underlying basis between the National Academy report and the EPA’s report, they are probably 98 per cent identical. The difference was, we took the further steps and looked at policy options. And of course a National Academy report wouldn’t do that. But projections, climate sensitivity, the whole range of sort of foundational information is probably the same. Gizmodo: What, if any, was the fallout at EPA after that? I continued to work on it for a while, but then both John Hoffman and I got sidetracked on this other little issue—and that was the ozone layer, and chlorofluorocarbons. 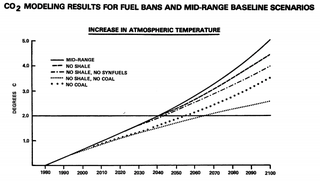 So in ‘85, maybe as late as ‘86, our attention really shifted to what became the Montreal Protocol. Gizmodo: You modelled out these policy ideas—fossil fuel taxes, fossil fuel bans—why were you focusing on those ideas? Did they seem likely at all to be used, or were you just presenting options? Seidel: Let’s be clear: nothing seemed likely to be used at the time. But they were the obvious policy levers. A carbon tax, bans, those are the things that jumped out at you then, and they’re still the things that, to some extent anyway, are considered today. Gizmodo: Well, we do finally have some policy proposals starting to take shape, in the form of the Green New Deal and surrounding ideas. Does it surprise you at all that some of those same policy proposals are still out there, only with 36 fewer years to implement them? Seidel: In terms of the policy levers, I think there is a more robust set of possible tools which can be used. Many of them still do come down to a price on carbon. The good news is that the alternatives [to fossil fuels] are way cheaper than certainly we anticipated in the report. If you look at the things that the report got wrong — I couldn’t find the term “wind” in there anywhere. The good news is, we’ve come a long way in terms of cheaper alternatives to fossil fuels. The bad news is, we have much less time, climate change is already on top of us. Gizmodo: Are there particular messaging approaches to try and sell those policies that you think are better or worse, given your experiences? Seidel: We used to talk about it as something that would impact our grandchildren, and now you can point to the wildfires, you can point to the extreme events and the huge costs associated with them—that has made it so much more real for people today. In the end, that should really help policy makers in terms of taking actions. I still think putting a price on carbon is the way to go. I was heavily involved in the Waxman-Markey first-term Obama administration efforts that died in the Senate. Whether that approach is better going forward, or a tax-and-dividend approach makes more sense, that will be for others to sort out. Gizmodo: How do you feel about the fact that you, and others, were warning about this so long ago, and were more or less ignored up until today? Seidel: I think there is a common thread among all of my colleagues who work on climate change—you have to be optimistic. I think that helps quite a bit. I also had the experience where a couple of years after that report came out I dug into ozone layer issues, and there we had tremendous success. Globally, with a treaty that all nations of the world signed on to; technology has changed dramatically, the costs were far less than expected. So, we demonstrated early on, back in the late 1980s, that in fact we could tackle these global environmental problems. There are reasons why climate has been a tougher issue to make progress on, but those are problems that can be overcome. Gizmodo: So it doesn’t keep you up at night, that you wrote this so long ago and we ended up here. Seidel: When I used to give talks on climate change, I would describe it as the worst-case public policy issue you can imagine. It is global in nature, it cuts across all sectors of the economy, there are lag times involved, the science is challenging; you couldn’t create a more challenging problem. There are legitimate reasons why this has been so hard to tackle. But I am still optimistic that it will be [tackled]. And I felt we were on a pretty good path up until a recent election. In the early years, there was bipartisan support for action on the ozone layer, and action on climate change. Some of our strongest supporters on those issues early on were Republican senators, like Senator John Chafee, and others. To see this devolve into a partisan issue, that I do find very frustrating, because this should be science- and economics-based, not partisan-based.